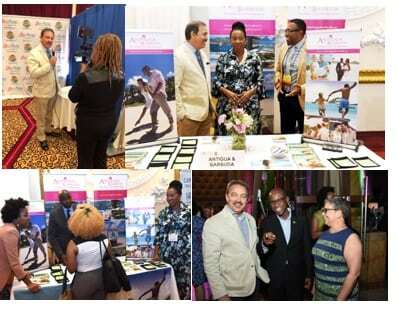 Caribbean Week 2018, was a resounding success for Antigua and Barbuda, where the destination asserted its position as the destination of choice in the Caribbean and as thought-leaders in Caribbean Tourism led by the Minister of Tourism and Investment, Hon. Charles “Max” Fernandez, with Antigua and Barbuda Government officials. Minister Fernandez, with Antigua and Barbuda Tourism Authority’s CEO, Mr. Colin James and Tourism Consultant, Ms. Shirlene Nibbs with the support of the North American Tourism Authority team fulfilled a strategic plan to leverage the greatest assets of the team and create the greatest impact across the variety of events throughout the week that included various Ministers and Senior Government officials, media, influencers, and investors. After the success of the Government, thought leadership programs and media marketplace that saw over 130 media in attendance, the week ended on a high with an exclusive top-tier media luncheon. At the event Minister Fernandez was able to share the positive tourism news for Antigua and Barbuda that included the destination achieved the highest number of total tourist arrivals with over 1 million visitors in 2017. Additional exciting gains include exponentially increasing airlift for Winter 2018. From Miami, American Airlines will be doubling flight capacity with an additional daily flight. Delta is introducing new service from New York –JFK, as well as announcing an early start for the Atlanta service to provide early access for the peak season. The Minister shared the exciting growth for the island with major property developments that will be introduced over the next two years, as well as the two for 2018: the already popular luxury glamping Wild Lotus and Hodges Bay Resort and Spa opening in October. Combined with the news of the major strides Barbuda is making and that Barbuda Belle is reopening in November, media left impressed and excited to share the positive messages of the twin-island nation. Friday evening was the celebratory end to the ‘official’ week with the ‘Rum & Rhythm Benefit,’ for an audience of over 700 attendees that included important Tourism officials and vendors, top Caribbean personalities and celebrities as well as significant representation of the Caribbean Diaspora community who are an integral part of investment opportunities. The evening featured samplings of a variety of top-shelf award-winning, eclectic authentic cuisine, pulsating music and a silent auction where proceeds go to the CTO Scholarship Foundation, a charitable organization that provides scholarships to Caribbean nationals to pursue studies in tourism, hospitality and languages. Antigua and Barbuda had the strongest and most vibrant presence, with major ice sculpture, food by celebrated Antiguan chef Christopher Terry and cocktails by Antiguan mixologist Ralph John. The Antigua and Barbuda lounge was packed throughout the evening with guests at the sold-out event. The evening was the perfect end to end a week of creating positive relationships.